I’d like to introduce you to The Wildcat Sanctuary, a 501(c) (3) non-profit, located in Sandstone, Minnesota. My name is Tammy Quist Thies and I am the founder and Director of the sanctuary. The Wildcat Sanctuary is a no-kill rescue facility that provides for the humane rescue and sheltering of unwanted, mistreated, and neglected privately owned wildcats that pose a risk to public safety. We do not buy, breed, trade or sell animals. TWS is committed to public education about the captive wildlife crisis; offering veterinarian training opportunities; and supporting legislative solutions to the public safety issues created by private ownership of wild animals. At TWS, animals are never bought, sold, bred, traded, or mistreated in anyway. Each resident is given every opportunity to behave naturally in a wonderfully humane environment for life. We provide habitats not cages for the cats complete with pools, perches and temperature controlled buildings. The Sanctuary is the only accredited big cat sanctuary in the Upper Midwest. The vision and need for The Wildcat Sanctuary has garnered endorsements from the Minnesota Zoo and the University of Minnesota’s Veterinary Care Program. Unfortunately, hundreds to thousands of exotic cats are sold to roadside zoos and to individuals as pets. A surprising number of people are buying these wild animals as cubs, without understanding the difficulties involved in caring for and containing them properly as they mature into adults. The results can be tragic for the owner, the public and the animal. The exotic pet trade causes more suffering for big cats than poaching, loss of habitat and all other atrocities combined. Meet Liberty, a cougar rescued from a rural farm. Liberty was no larger than a lynx. She was emaciated and dehydrated. We couldn't get over how small in stature this cougar was. The owner who was a vet technician explained that she had fed only milk to Liberty her first year of life and that Liberty had fractured both of her back legs which had gone untreated. Liberty cannot extend her back legs completely; she has a severe curvature of the spine and pelvis. The tops of her ears were dangling by a small amount of flesh but were about to fall off. She had urine burns on both sides of her tail. The owner said Liberty wasn't eating or drinking very well. But Liberty ate four times the first night she arrived at TWS and eight additional meals the next day. She continues to love her food and has put on weight each day. Liberty weighed 45 lbs. upon arrival at TWS. This is the size of a six- month-old cougar - Liberty is six years old. Though Liberty's journey has been rough, she finally has a life that will ring true to her name. She has become such a social cougar and her chirp can be heard constantly. For a small girl, she sure shows Raja her cougar cage mate, who is boss. She has become a favorite at The Wildcat Sanctuary and she reminds us everyday how important our work is. Our sanctuary relies solely on public donations. Individuals and businesses can get can help support the cats through different sponsorship, donation, and volunteer programs. Our motto is they will never know freedom, but with your help, they can know compassion. 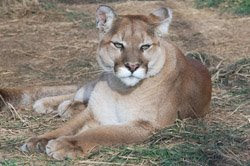 Visit Wildcatsanctuary.org today to learn more and to meet all the cats that call The Wildcat Sanctuary home. Thank you all for reading about this great facility that is doing so much for abandoned and abused wild felines. Through our interaction, I've felt that many of you fellow bloggers and readers care deeply for the threatened cats and want to make a difference by helping them out. Here is an opportunity to do so. If you find time, kindly do visit the website of The Wildcat Sanctuary and maybe even help out the magnificent cats they are caring for by going here. What a brilliant facility! If only I lived in the US I would definitely donate. It surprises me that so many wildcats are kept captive. So good to hear from you! Have asked ML to re-post on the program to backup a blog. We hope she will, as there are many new bloggers. So keep an eye on the CB, in case you can't remember the name of the program you were trying to think of. Sooo sorry it's taken me forever to visit again. We've all been sick here on the farm and I've missed reading my favourite blogs. This is a fantastic post. I've really enjoyed reading this. I will be reading your previous post as well and catching up on all the cat news. Also Zion Wildlife Gardens has had a fresh new start. The Park is now open again and new initiatives for the animals there have been instigated by Operator Tim Husband of Zooworks. Fantastic for all concerned. from me and Sasquatch who is biting my leg ...again. Oh wow, what a wonderful post, and what excellent work Tammy is doing with the Wildcat Sanctuary to help rescue and care for big cats that were held captive. The story of Liberty deeply touched me -- what a beautiful girl she is, and I'm so glad she was rescued and is well-loved and cared for. The Ballicai and I send hugs and purrs! What a lovely sanctuary! I can't understand how people can buy wild cats. It is so unfair on the poor cats. Poor Liberty, she had such a bad time and to think that her former "owner" is a vet tech makes it even worse. Surely she of all people should have known better! Thank you so much for the awards. We are very happy to receive them and conCATulations to you for receiving them also! So wonderful that there are places like this, truly amazing! TFS! What an interesting post about a wonderful facility. I will help spread the word, too! This is a great facility. I'm so happy to hear that there are some people still care about other species than themselves. These "humans" should be treated the same way they treated their animals ! I am happy that shelters like this exists ! Oh - what a lovely post and lovely story. If I ever have the marvelous luck to come to Hobart or Tasmania, you will certainly be on my "look up" list! May you also have a wonderful week! That is so amazing, so great! I really respect Tammy and all those people involved who set up the Sanctuary. Over here we have one facility that takes care of a variety of animals, anything from a mistreated turtle, dogs, cats, birds, donkeys, monkeys and more. It's all done privately. so nice to know that kindness towards our animal friends still exist. Its a great job !!! What a truly amazing place. We are in awe of the wonderful people who are giving these gorgeous creatures the chance and ability to live in safety. They sure look healthy and happy there. salam friend ,,,im sacared of tiger,,hi..hi.. They look so adorable but I know better they are fierce and predatory. Thanks for sharing such awesome pictures and a great post. It is wonderful to read about the work that you do. It's a blessing to hear about animals like Liberty who have done so well under your care. Thanks for the info. What an awesome organization. My friend, a wildlife biologist, rescued a cougar from a small farm many years ago. The people had DECLAWED him! Education is key and you're doing an awesome job with that. and great post you have here. It's so wonderful that there is such a facility to care for wild cats. Thanks for the post. It is just wrong that people should try and "own" wild cats. Just wrong! I am glad such a facility exists to correct those wrongs. i am so relieved that organizations such as this one exist! thank god! and next time i have a little extra scratch, i will send a donation. :) ROAR! I'm going to put a widget on my blog (even if I have to create it) and direct folks to the site. Thanks for the tip off Snowforest and great guest post from Tammy. What a blessing that there are places like this! Liberty's transformation is awesome! Obrigada pela visita e comentário. Seguirei teu blog que é uma maravilha. What a wonderful story about Liberty. I'm so happy she was saved. What a great name as well. This is a nice facility for animals away from cruel acts of people. Wow! I am so happy that Liberty is okay and that such a wonderful place exists to help them. I feel sad she ever had to endure what she did. A very very noble project - and must be much needed to provide a caring shelter for wild cats who happened to be the beloved pets once upon a time! Brilliant idea! Wish we had that here but in Malaysia too many people see tiger and think food and $$$. It's very sad. I volunteer for this organization and can't thank you enough for the coverage you've given. We're located in a very rural area, so it's very hard to get the word out about the work we do rescuing these animals who have been so abused. Money is always an issue for us. There just never seems to be enough for all we're called on to do. If you ever have the opportunity to help in any way financially (no amount is too small), please consider helping The Wildcat Sanctuary. You CAN make a difference! What a wonderful facility! It is so nice to know there are people and places like this to help rescue our big wild cousins. I can't believe how cruel and stupid humans can be thinking these amazing creatures can be "pets." Thanks for the nice wishes for our soon to arrive blurpy. We can't wait to meet him. I am so impressed with folks like this who do the good work. The Wildlife Sanktchuary sounds like such a wunnerful place fur the reskued big kitties! Nice change in post from you as this was great cat news too - good to know they have such nice facilities. just want to say hello and have a blessed weekend. the work I have got from here is pretty nice dear. I like this, information and the work shared here is nice.